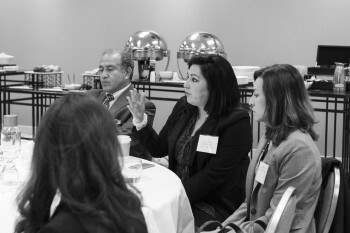 Retired consumer packaged goods executive Lou Nieto speaks at the HACE Executives' Breakfast Forum. Photo by Sheila Barabad. On May 5, HE attended the Executives’ Breakfast Forum hosted by the Hispanic Alliance for Career Advancement (HACE) at the Palmer House Hilton in Chicago. 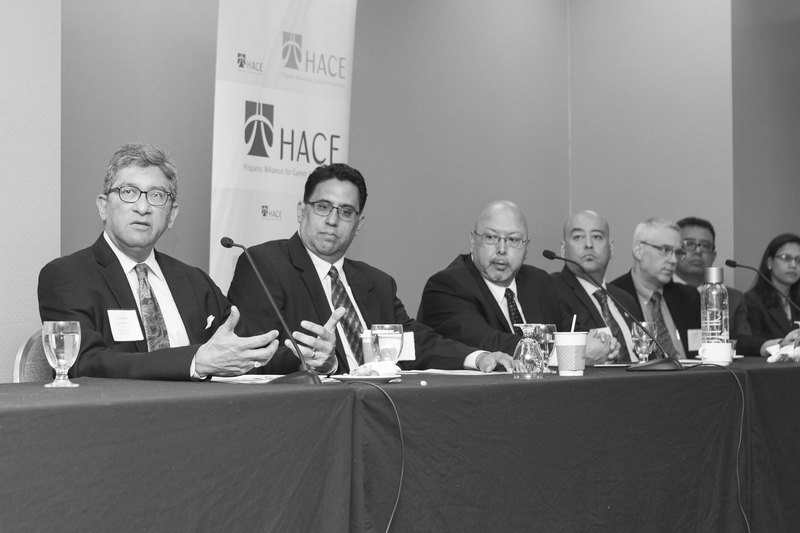 Moderated by HACE board member Dr. Robert Rodriguez, also the president of DDR Advisors LLC and author of Latino Talent: Effective Strategies to Recruit, Retain and Develop Hispanic Professionals, the two-hour event consisted of a breakfast buffet, a networking session, a welcome address by HACE president Patricia Mota, and a 90-minute panel discussion and open Q&A. Rounding out the panel were Chicago Executives’ Club president and CEO Ana Dutra, retired consumer packaged goods executive Lou Nieto, Reilly Company president Ernie Watts, AMLI VP Martha Arteaga, Golden Hill Foods VP and director Demetrio Garcia, Golin Harris executive director Zandra Zuno, Kraft Foods Group chief diversity officer Jorge Quezada, PNC Bank VP Dorothy Abreu, BP America senior counsel Steven Hernandez, and Northern Trust Global Investments VP Luis Amaya. DDR Advisors LLC president Dr. Robert Rodriguez moderates the panel. Photo by Sheila Barabad. 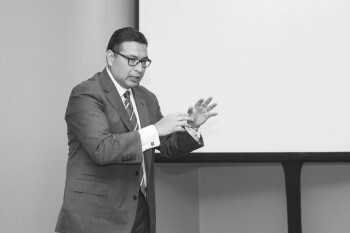 The discussion revolved around a five-point frame, constructed by Rodriguez, of key factors impacting Latino executive advancement: the issue of over-mentorship and under-sponsorship (“a mentor talks to you; a sponsor talks about you,” Rodriguez clarified), the ability of Latino executives to pull up the next generation of leadership, the need to establish relationships with top-tier executive search firms, the capacity to convey an executive presence, and the necessity of taking on profit-and-loss responsibility. Hernandez echoed the notion that there is a critical difference between asserting one’s identity and attempting to ascend ladders blindly by abusing one’s heritage. “Corporations are not really altruistic—they’re not going to go out of the way to say, ‘We need more African Americans or Latinos because it’s the right thing to do.’ They’re businesses,” he said.